Known as one of the best antioxidant foods, cloves are well-known for their use as an externally applied local antiseptic (clove oil) that numbs on contact for dental pain. But not many folks are familiar with a variety of other health benefits of cloves, which includes combating Candida and fighting bacterial infections. The dried buds of cloves contain an aromatic oily substance that is the essence of the spice’s medicinal and culinary properties. It’s wise to purchase cloves in their bud forms. Purchased powders may have lost most of their potency by the time you buy and use them, while dried buds hold up to three times as long. Clove’s oil is the key for spicing foods and promoting health. Cloves can be used to make teas by putting the buds or powder into hot (not boiling) water. But the biggest health bang for the buck comes from clove essential oil. Clove oil is a great anti-fungal. It’s even recommended by some to treat Candida. 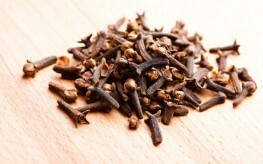 Clove teas, which can be made from either the clove buds or oil, are often recommended for Candida sufferers. The oil is also useful for direct applications to outer skin fungi, such as ringworm and athlete’s foot. Note that clove oil is usually very strong, which can lead to temporary discomfort. Too much can cause manganese toxicity. The oil could be diluted or used by putting drops into tea. Clove has anti-viral anti-bacterial properties as well. It can be used for colds, coughs, and even a “seasonal” flu. It’s an unusually powerful antioxidant. As an essential oil, clove’s ORAC rating soars to over 10 million! Most other antioxidants are rated in the tens of thousands to a maximum of a few hundred thousand at best. Producing the oil from clove buds concentrates clove’s eugenol, the main active ingredient of clove. Eugenol is an anti-inflammatory. Clove’s flavonoids also contribute to the high ORAC level of the essential oil. Clove has been discovered to help prevent adult onset diabetes by tripling insulin levels. Clove is one of the highest sources of manganese you’ll find. Manganese is vital for metabolism, contributes enzymes, promotes bone strength, and also adds to clove’s high ORAC antioxidant value. Magnesium, calcium, vitamins C and K all make strong appearances in clove. Omega-3 is in abundance in clove as well as many phytonutrients that enhance the immune system. Caution: Young children and pregnant or nursing women should not use clove.